Cafe Rio Sweet Pork like you’ve never had it before – AKA the real, juicy, saucy, sweet and spicy deal! I am helping with a youth church fundraiser on Cinco de Mayo and we are making a Cafe Rio taco bar with this Sweet Pork as the star – because it’s center stage delicious. This recipe is on oldie but goodie so I thought it was time to republish new photos and add some tips and trick. As you can read by the reviews, this is a beloved recipe by many and is even my mom’s favorite recipe to make for entertaining (even served to Elder Holland) and I ‘m sure it’s soon to be a new family favorite of yours too! Cafe Rio calls their Sweet Pork Barbacoa, “Our signature dish. Our crowning achievement. 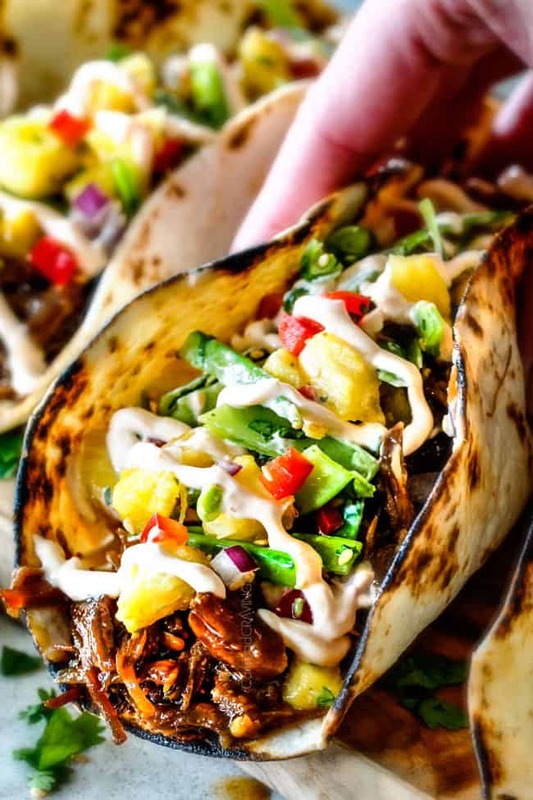 Our recipe royale!” If you have eaten at Cafe Rio, you’ve tasted exactly what they are talking about and why the small restaurant chain has a loyal following willing to drive hours to taste the juicy, flavorful, saucy, sweet and spicy sweet pork. I wanted to do their sweet pork recipe justice so in preparation for this recipe, I looked up dozens of Cafe Rio Sweet Pork Recipes online and was surprised that all of them either added hardly any spice (like 1/4 teaspoon garlic powder) or no spices all together. Cafe Rios “signature blend of spices,” however, is crucial to the authentic taste of this recipe, so I’ve perfected the blend and now we have the perfect Cafe Rio Sweet Pork, in my humble opinion. But don’t be afraid, this pork is not spicy, just exploding with flavorful. I actually added hot sauce to mine but it was perfect for my parents. Spice Rub: After we sear the meat, we rub it with our spice rub. Instead of rubbing oil all over the meat, simply ladle some of the leftover juices/oil in the pan from searing. If you skip searing your pork, you will need to rub it with some olive oil first so the spices stick. Cook until tender but not fall apart tender. When your pork is tender enough shred into chunks but not fall apart tender, shred it into larger sections in the crock pot and continue to cook on LOW for 30 minutes until it is practically fall apart fork tender. This allows the flavorful slow cooker contents to seep into every pork crevice without it becoming overcooked. Drain pork. Once pork is tender, and ready to shred, I place my strainer on top of a large bowl to catch the slow cooker contents so the fat doesn’t go directly in my sink, then refrigerate the bowl and skim the fat later and ditch the rest in the sink sans fat. Add enchilada sauce and brown sugar to taste. Once drained of excess liquid, we add our pork back to slow cooker along with enchilada sauce, brown sugar, green chiles and remaining spices. Taste buds vary widely when it comes to how sweet people like their pork. This Cafe Rio is supposed to be sweet – but just how sweet is up to you. I recommend starting with 1/2 cup brown sugar and adding more to taste. You can also add additional chipotle chili powder or hot sauce if you would like it spicier. You can also add more or less enchilada sauce depending on how “saucy” you want your pork. If making ahead, make the Sweet Pork Recipe through step 5 in which you shred the pork into large sections. 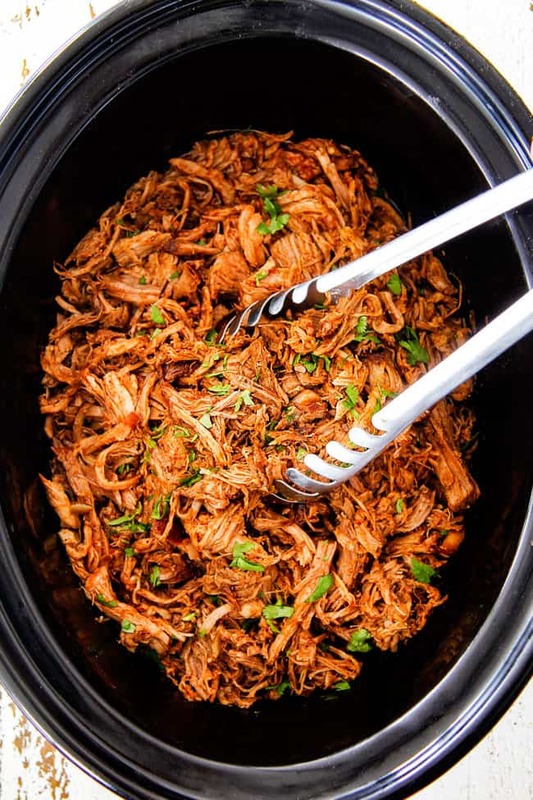 After you do this, let your slow cooker sit at room temperature for a bit so the crockpot ceramic insert can cool down and then cover and place ceramic insert into fridge (PORK AND ALL THE LIQUID). 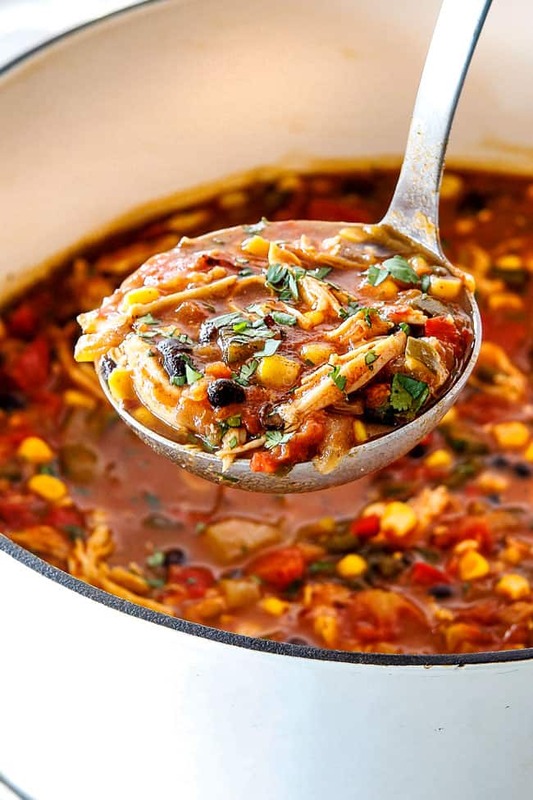 The next day, skim off the hardened fat from the top and heat on LOW for about 1- 1 ½ hours to heat through, then continue with the rest of the recipe as written. Cafe Rio Sweet Pork Salad: Layer a large burrito size tortilla with cheese and melt. Top with black or pinto beans, cilantro lime rice, sweet pork, and romaine lettuce. Top with Pico de Gallo, fresh guacamole, salsa tortilla strips, cilantro, cotija cheese and Tomatillo Avocado Ranch or leave out the Avocado and make it Tomatillo Ranch. Cafe Rio Sweet Pork Burrito: Layer a burrito size tortilla with cilantro lime rice or Mexican Rice, black or pinto beans, cheese, sweet pulled pork, then baked in an oven. Serve with your favs of pico de gallo, romaine lettuce, guacamole, sour cream, homemade salsa, salsa verde. etc. Cafe Rio Sweet Pork Enchiladas: Fill corn tortillas with layers of cheese and sweet pork and topped with red or green enchilada sauce and cheese and bake. Cafe Rio Sweet Pork Tacos: Pile a flour tortilla with sweet pork, Mexican cheese, lettuce and serve with your favs of pico de gallo, romaine lettuce, guacamole, sour cream. etc. Cafe Rio Sweet Pork quesadillas: Layer a burrito size tortilla with Mexican cheese and sweet pork and grill until golden, cheesy perfection. Serve with your favs of pico de gallo, romaine lettuce, guacamole, sour cream. etc. Cafe Rio Sweet Pork Tostada: Layer a A corn tortilla with sweet pork, cilantro lime rice, black or pinto beans, romaine lettuce, pico de gallo, tortilla strips, cilantro, sour cream, and cotija cheese. Drizzle with Tomatillo (Avocado) Ranch. Cafe Rio Sweet Pork Nachos: Pile thick restaurant style tortilla chips with Mexican cheeses or chile con queso, sweet pork, black or pinto beans, pico de gallo, sour cream, and fresh guacamole. No matter how you choose to serve your Cafe Rio Sweet Pork they all will taste AMAZING because they include this pork! 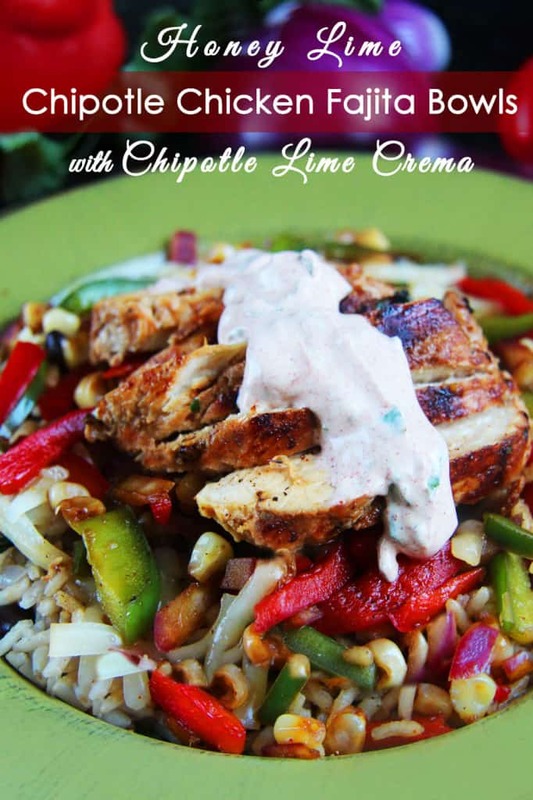 Want to try this Cafe Rio Sweet Pork Recipe? Pin it to your MEXICAN, BEEF, or SLOW COOKER Board to SAVE for later! 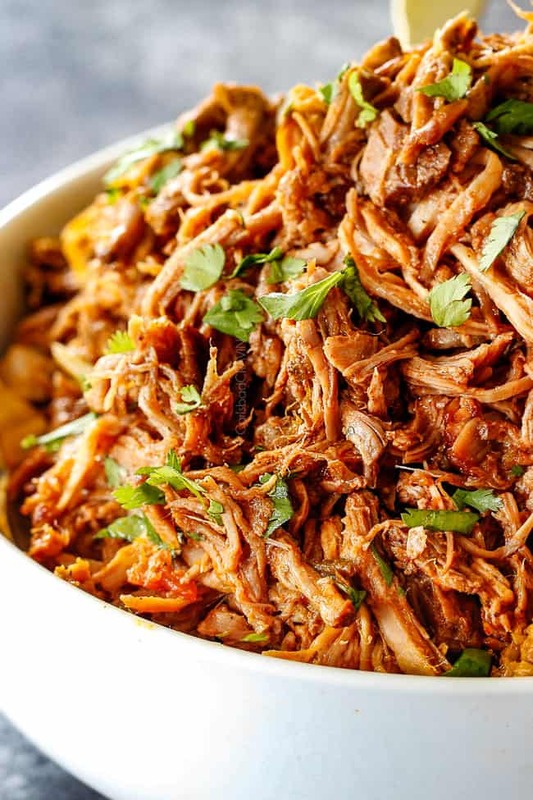 Cafe Rio Sweet Pulled Pork like you've never had it before - AKA the real, juicy, saucy, sweet and spicy deal! 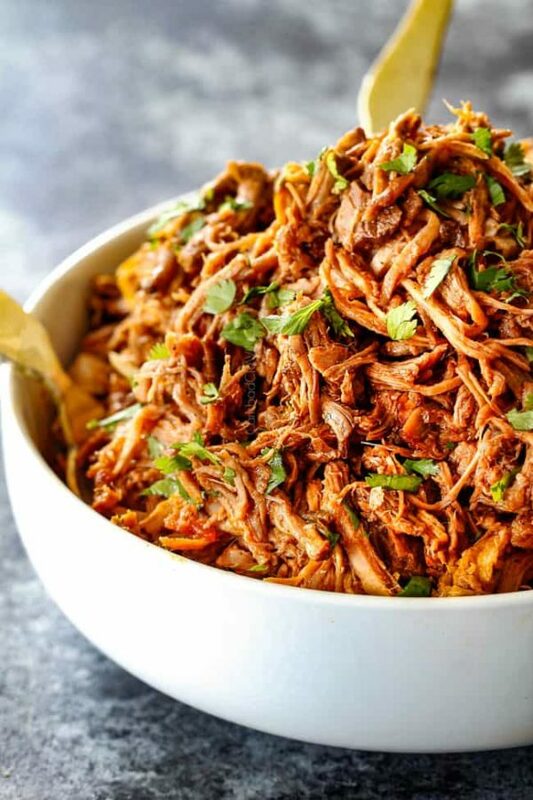 Cafe Rio Sweet Pork is on of the most tantalizing delicious Mexican meats on the planet - and now you can make it in the comfort of your own home and in the ease of your own slow cooker! This melt-in-your-mouth sweet pork is wonderfully versatile and the perfect make-ahead meat for tacos, salads, burritos, tostadas enchiladas, etc. It's also fabulous for crowds and entertaining! Mix all of the Mixed Spices together in a resealable container. Set aside. Lightly grease slow cooker with nonstick cooking spray. Set aside. Heat 2 tablespoon olive oil in Dutch oven, cast iron or stainless steel skillet (you can use nonstick but it will just take longer) over medium-high heat. Using tongs or 2 forks, sear pork on all sides until lightly browned. Transfer pork to slow cooker. Ladle a spoonful of the pan juices over the meat so the spices will stick. Separate out 1 1/2 tablespoons spices to use after the pork is cooked. Rub all remaining spices evenly over all sides of pork (it will seem like a lot but use all of it). Add all Slow Cooker Phase 1 Ingredients to the pork. Cook on LOW for 6-8 hours or until pork is tender enough to shred. 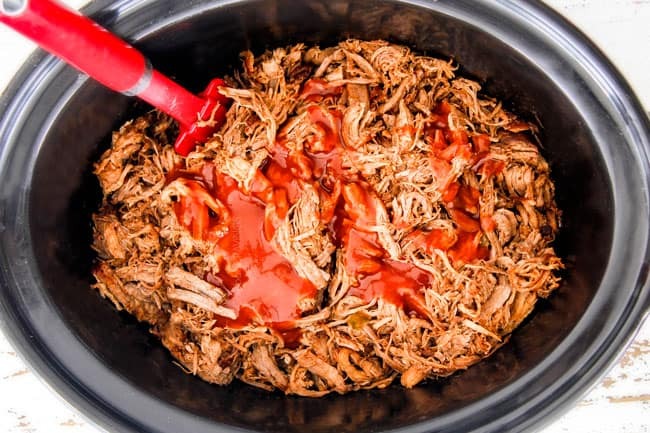 Shred pork into larger sections in crock pot and continue to cook on LOW for 30 minutes. 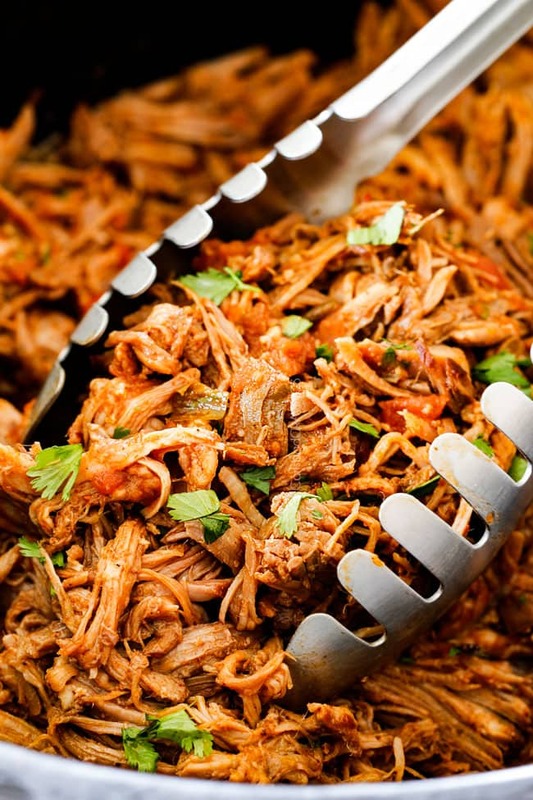 Transfer all of the slow cooker contents to a strainer to drain off excess liquid from pork. Transfer pork to cutting board and shred into smaller pieces and discard any excess fat. 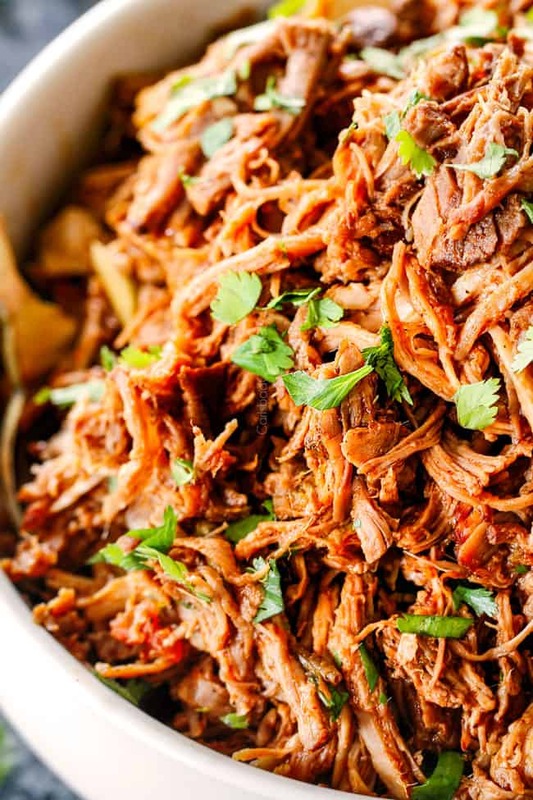 Add pork back to slow cooker (along with any accumulated green chiles, etc.) then stir in all of Phase 2 ingredients starting with just 1/2 cup brown sugar. Cook another 15-30 minutes on LOW or until heated through OR just keep on the warm setting if you aren’t serving immediately. Taste and add additional brown sugar for sweeter, hot sauce for spicier or more enchilada sauce for saucier. Serve in tacos, enchiladas, burrito bowls, etc. with Tomatillo Avocado Ranch Dressing. Do I have to sear the meat? As Gordon Ramsey says, "color - flavor." Searing the meat creates the Maillard reaction resulting in rich, deep, complex flavor which cannot be achieved in any other way. It also helps the inside of the meat from drying out. You can skip this step, and your pork will still be good - just not as good. Spice Rub: If you skip searing your pork, you will need to rub it with some olive oil first so the spices stick. Cook until tender but not fall apart tender. When your pork is tender enough shred but not fall apart tender, shred it into larger sections in the crock pot and continue to cook on LOW for 30 minutes until it is practically fall apart fork tender. This allows the flavorful slow cooker contents to seep into every pork crevice without it becoming overcooked. Add enchilada sauce and brown sugar to taste. Taste buds vary widely when it comes to how sweet people like their pork. This Cafe Rio is supposed to be sweet - but just how sweet is up to you. I recommend starting with 1/2 cup brown sugar and adding more to taste. You can also add additional chipotle chili powder or hot sauce if you would like it spicier. You also add more or less enchilada sauce depending on how "saucy" you want your pork. You can make this pork mostly the day before if that’s easier and then you don’t have to worry about cooking times and it turns out just as good – or better. If making ahead, make the recipe through step 5 in which you shred the pork into large sections. After you do this, let slow cooker sit at room temperature for a bit so the crockpot ceramic insert can cool down and then cover and place ceramic insert into fridge (PORK AND ALL THE LIQUID). The next day, skim off the hardened fat from the top and heat on LOW for about 1- 1 ½ hours to heat through, then continue with the rest of the recipe as written. I often purchase my pork shoulder from Costco. 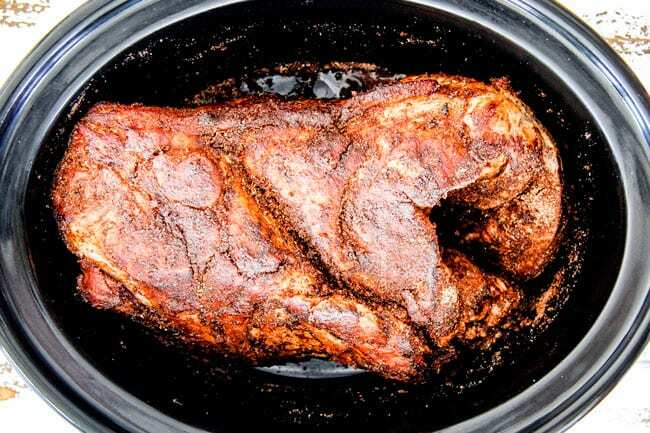 Each pork shoulder package is approximately 16 pounds and contains 2 7-8 pound halves. For convenience I like to cook the entire half so I wanted to include instructions for Costco pork. It is generally the same with these exceptions (and below measurements). You will separate out 2 tablespoons (instead of 1 1/2) Spice Mix to add to the pork in Phase 2. The cooking time might increase by one hour. My Costco pork generally takes 8 hours. I’ve made this several times, adjusting slightly (less coke, no sugar, adding chipotle & adobo) to our tastes and cooking in an Instantpot at elevation. I serve it with your deliciously fresh Avocado Tomatillo Ranch sauce and get rave reviews every time! Thank you so much for sharing and all the work you put into your recipes! You are so welcome Elaina, thank YOU for such a kind comment! I love hearing you are enjoying my recipes and have made this several times! And you are so right- it is perfect with the Avocado Tomatillo Ranch! Hi Stephanie, I would use 1 teaspoon chipotle powder and that way it definitely won’t be to spicy. You can always add hot sauce later if needed. Enjoy! I used the 1 teaspoon of chipotle as you instructed and it was so so so yummy! I live in Canada so have never been to cafe rio but this pork is amazing! 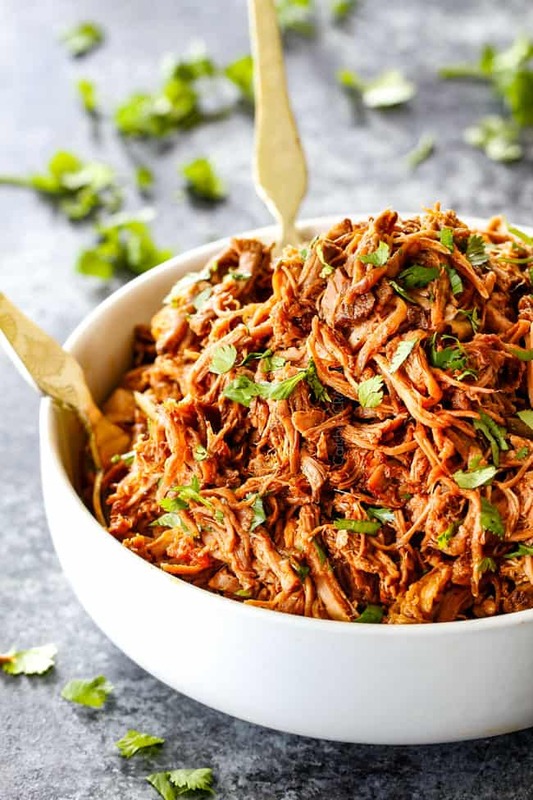 Definitely my new go to pulled pork recipe 🙂 I love the saucy side with the enchilada sauce! My husband and daughter both loved it as well. Oh good, I’m glad 1 tsp was the perfect amount of heat for you and that it was a hit with the fam! Thanks so much!